A week passes by. Meanwhile, Anvi gets closer to sanskar and gets attached to him day by day. Ragini gets frequent calls about a blackmail. Meanwhile , Anika steps in the 2nd tremester in her pregnancy. The room is shown beautifully decorated by millions of roses and candles , lighting ..the room is filled in aroma of rich vanilla, just the way swara liked it. A young lady is shown draped in a maroon bridal lingerie baby doll dress, matching heels and gently tinted lips, long stockings . she admires hersefl in the mirror and her 34-23-34 frame. Her beautiful face is shown (helly shah)..aka…Anvi. Anvi – today is the day that me and sanskar will finally be one. Im sure he will love my surprise. And I will brand him with my love today. I will finish off all swara’s memories. I may or maybe not swara. But that shouldn’t take away my love from me. Sanskar opens the door and enetrs. The wedding night setting of the room makes him frown between his brows. He gazers at Anvi. Anvi comes and wraps her arms around his torso and gently pecks his chest. Sanskar breaks the hug. .arent you the one who calls me swara..so this is mine na..
.yes…its yours..but why r u wearing this now ? I thought..we would consummate our wedding today..
Anvi looked down coyly. Sanskar smiled and touched her cheeks gently. As anvi pushed her lips gently in the air and closed her eyes, snaskar smiled and kissed her forehead. Anvi was genuinely surprised. Nahi swara ..swara used to be extremely possesvie about me. and thus I refuse to get intimate without her own consent ! im sorry. Sanskar smiles and leaves the room. Anvi sits on the bed all mad . Dadi and suhana come out of the kitchen while, Ashish comes out of his bedroom. Ashish – laksh…ragini..shivaay..kaanchi..whats all this noise about …. Kancchi – see na dad, these people have barged into our house ! Ragini is shown in an light pech nightly and pony hair..laksh and shivaay are shown standing in their night trousers and T shirt . Kanchi is shown in a pink nighty. Laksh – dad..these people have to say that Anvi…is actually Devanshi . Devanshi roy , wife of Mr.Vardaan roy and daughter in law of Suhasini roy. Ashish – but who are u people ? The man forwards his hand to be shaken . Vardaan roy. The only heir to roy group of industries. A middle aged lady smiles and puts her hands together for greeting. Suhasini – radhe krishna . hum suhasini Roy. Vardaan ki mata ji . Shivaay – radhe krishna..jai shree krishna..namaste ..namaskar..now please leave. We don’t know any Devanshi. Vardaan points towards a photo. Shivaay – that’s funny. You are pointing to the wedding photo of my brothr and his wife. It is clearly shown that she is his bride ! Vardaan hands over a piece of newspaper to shivaay with swara’s death news. shivaay . I am not claiming Mr.late swara sanskar Raichand as my wife. I know she is sanskar’s wife. I claim this girl staying at your house as my Swara, this Anvi Sharma. Who has lost her memory. Suhana – oh really ? and what proof do u have ? Vardaan shows a photo of him with Anvi. The whole family gets shell shocked. Dadi – but if anvi is not swara,. She might even not be ur devanshi. Vardaan – I believe I can fee her breathing. Suhasini and vardaan are shown seated in the hall. Anahita is shown fiddling with devanshi’s pictures. Anahita rolls her eyes – suhana..i must say swara’s face is very common in india..this is the 3rd girl who resembles ur bahu rani’s face. Im surprised maaji. Dadi nods her head in disbelief. Suhasini – I want to meet my bahu. Laksh – swara will not come here ! Annie- lucky. Calm down. Beta. Ragini, go and call Anvi. Ragini looks uncomfortble, but Anika pushes her. Vardaan goes to hug swara, but she moves away and sanskarp ushes away by his chest ! Sanskar – what do u think you are doing ? Vardaan smiles wityh tearry eyes and holds sanskar’s hands. raichand thankyou very much. For taking care of my wife for such a long time. Anvi looks boggled and hides behind sanskar. Sanskar – what nonsense..this is my wife. Swara sanskar raichand. Not any devi . Vardaan – but mr. sanskar ! I don’t claim swara ji as my wife. I calim this, anvi as my wife. Sanskar – what the hell..dad, shivaay bhai..what is this ?? Ranveer hands over devanshi and vardaan’s pics to sanskar. Anvi enlarges her eyes in shock. Sanskar looks at anvi startled. Anvi nods her head in negative. Anvi is shown shouting at the top of her voice. Anvi – when I say im swara raichand. It means I am. Sanskar u tell him na ! im sorry if I look like ur late bahu. But im not any devanshi. Anvi – im not ur devu ..
Anvi – call me swara . Sanskar – talk about legal and logical proof vardaan . not these stuff. Ragini pats laksh’s shoulder – lakshya..im very scared . what if ..? Laksh – Ragini…nothing will happen. Relax. Sanskar sees Anvi. He tries to move away….Anvi stops him..
Sanskar – but u didn’t get your memory right ?? Sanskar – jo..jo ki tum ho…toh hum ise sabut ke saath proof karenge ….aur ekbaar sabit ho jaye , toh hume koi bhi juda nahi kar sakta !!!! Anvi smiles fadely. She hugs him. He hugs her back ! Laksh – why are u showing us your 32 teeh ha ? Suhana – now what new shock u have for us ? Vardaan – yes ..exactly I have a big shock for u ..Suhana Aunty ji. Ranveer – and whats that ? care to explain. 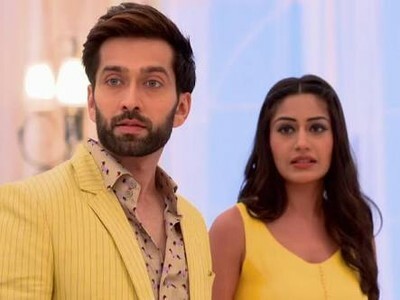 Shivika and kaanchi look on in indiffeence. Vardaan – that ur Anvi is my Devanshi. ! Anahita – fine beta. Prove it. Anvi and sanskar and raglak look on. Anvi grips sanskar’s arm tightly . Vardaan shows all a phot. Isnt this ur darling bahu..swara ? Dadi – yes. It is . and so ? Vardaan – do u notice the tattoo .?? Sanskar puts his pal on his forehead. Sanskar – oh yes. Swara had a heart tattoo at the starting at her thigh bones. Anvi looks on shocked. Sanskar grabs her hand and takes her to his room. All look on tensed . Sanskar – swara ..baby its okay. We will just show them the tattoo. Nothing will happen. And then they will leave . okay ? Anvi – but sanskar . Sanskar – no buts Swara..
Anvi quickly hugs him. sanskar pats her back. Sanskar turns her around . and opens her zip. Her milky white back is revealed. Sanskar turns her around and moves her dress a little away from the lowest point of her waist. He gets sheell shcoked. Snaskar smiles widely. The tattoo is shown intact. Sanskar gets tearry. He gently kisses the tattoo. Anvi closes her eyes. Anvi – sanskar I ..
Sanskar rubs her tattoo further and it comes off. Sanskar remains flaggerbasted ! Episode ends on Anvi’s helpless face. A little love is enough to finish off hatred!! oh anvi wants to consummate. good that sanskar refused to do it as she hasn’t gained her memory.I thought they consummated seeing their romance after marriage. didn’t know that swasan hadn’t. .shocking that vardhan claims that anvi is his wife devanshi.sanskar hugging swara n saying that once it’s proved no one can separate them was nice.sanskar finding tattoo on anvi n kissing it was romantic. shocking that it was fake.how will sanskar react now?nice pics. swasan had consummated di. but anvi doesnt think she is swara . so she said so. thanks alot ! swara used to be extremely possesvie about me. and thus I refuse to get intimate without her own consent ! im sorry. this is what he said. as he didnt touch her after swara’s demise. and that there is no proof that she is swara yet !